Read on to discover a dozen ways to design for a small-scale deck, including tips on how to choose an efficient design for a new deck or optimize an existing deck layout, plus styling ideas to make tight decks feel more welcoming. One of the best ways to ensure that you’re making the most of a small deck is to start with a design that fits your needs and the space. 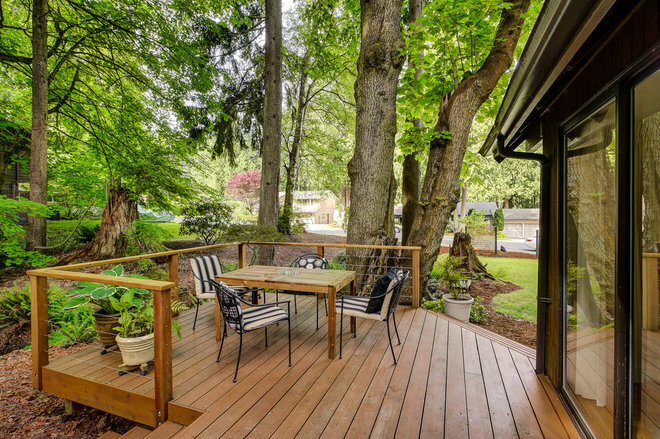 If you’re installing a new deck, start by identifying how you’d like to use the space. Then determine space and site constraints and choose the size and shape of your deck accordingly. Rectangular decks are the most common and can be sectioned off into multiple areas for different uses. With this efficient wraparound deck in Portland, Maine, the corner naturally divides the deck into two areas. 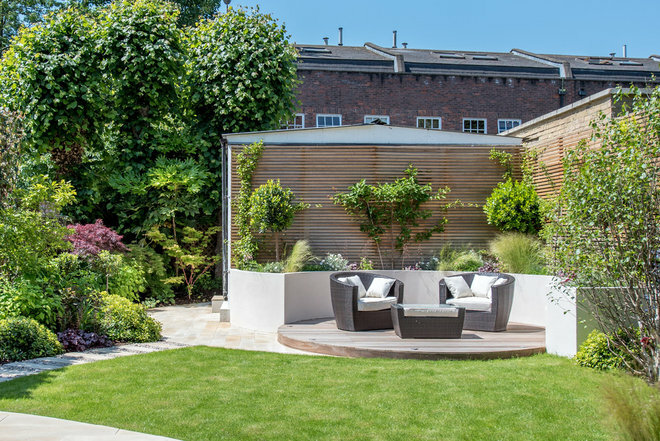 Small, round decks, like this one in a London garden by Kate Eyre Garden Design, can be well-suited for creating intimate seating nooks. 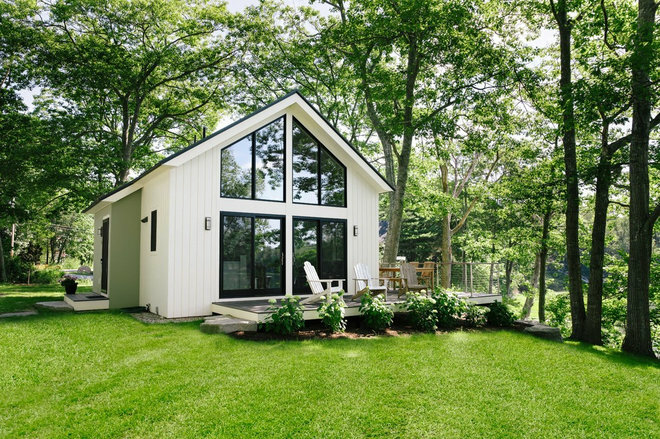 For irregular site layouts, you may want to consider a deck design that includes semicircular, square or angular pop-out sections that extend from the main deck to capitalize on a bit more square footage. Hiring a landscape architect or contractor can help make sure you start with a deck design that is best-suited to your site and fits in with your home and backyard. To make an existing deck more efficient, consider where you can fit in different elements — including furniture, lighting and cooking equipment — to save floor space and improve overall flow. You may decide it’s worth it to invest in built-in seating or new patio furniture to maximize the space. With this rectangular deck in Austin, Texas, the designers at B. Jane Gardens made the most of the relatively small square footage by tucking a square fire feature and built-in bench seating into a corner. They positioned a movable bench along a wall for additional seating and a dining table along the far side, keeping the middle section open. The layout feels spacious and inviting. If your site comes with a challenging feature, like a mature tree or a building support that breaks up the area where you’d like to install a deck, see if you can weave it into the deck design. 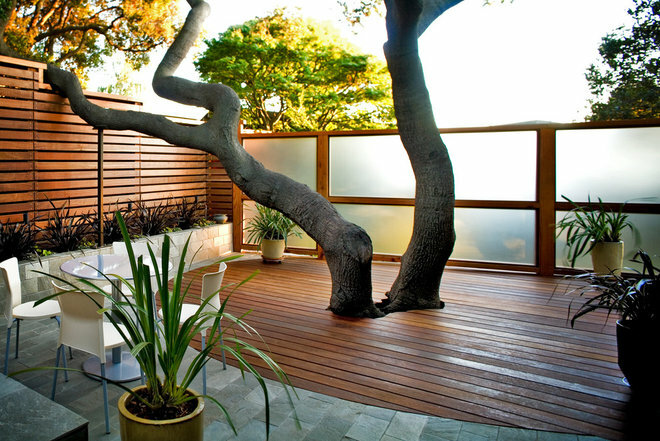 The deck built around an existing oak tree in this San Francisco Bay Area backyard, by ODS Architecture, allows for the tree to be preserved without compromising floor space. Plus, the oak acts as a stunning focal point and provides natural shade over the seating area. Don’t try to squeeze large furniture onto a small deck — it will feel feel cramped and cluttered and leave no room to move through the space. Instead, choose furniture to fit the size of your existing or future deck, and look for flexible designs, such as an extendable dining table. 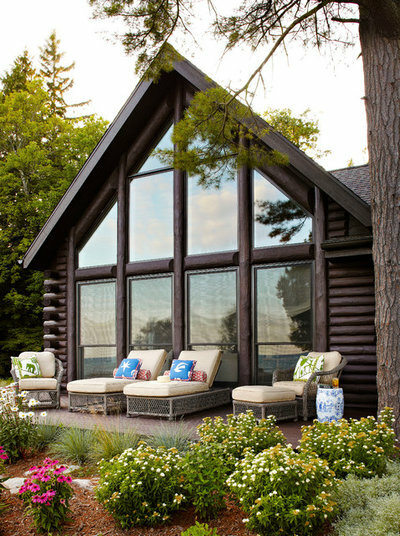 Here, the lounges chosen by Jessica Jubelirer Design for a viewing deck outside a lake house in Wisconsin take advantage of the waterfront view and fit the deck’s size. Save floor space and cast an inviting glow over a small outdoor seating area by hanging string lights, lanterns and wall-mounted exterior lights. 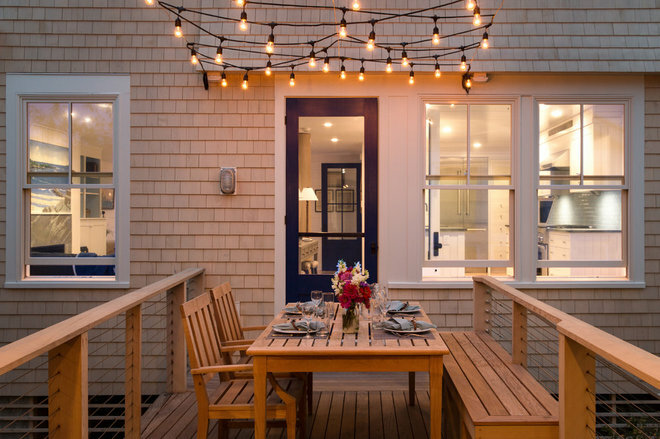 For this Portland, Maine, deck designed by Whitten Architects, three horizontal wires support a crisscross of cafe lights centered over a small outdoor dining table with seats for four. A deck built right off a room in the house creates bonus living space, even if the deck is modest in size. The more seamless you can make the transition from indoors to outdoors, the more the two areas will flow together, making both spaces feel larger. In this Vancouver home, large-scale glass doors connect the deck and the living room, allowing people to easily pass between both spaces. If there’s a grade change between your deck and the ground (even if it’s only minor), you will likely need to install railings to comply with local building codes. Small decks can feel more cramped if surrounded by heavy railings. 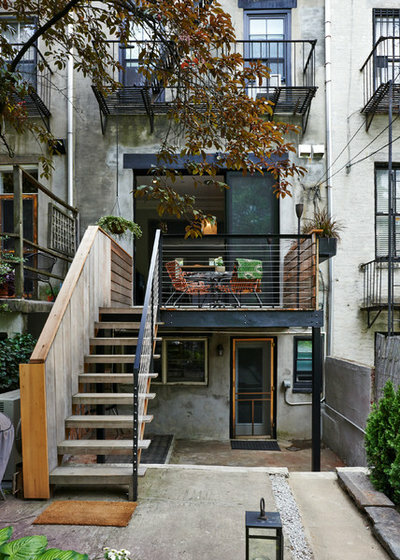 Instead, choose a style that appears light and open, like the cable railing surrounding this Seattle deck. It seems to disappear from view, expanding the perceived deck boundary and allowing one’s gaze to move out to the garden. Adding flowers and foliage can be a great way to make a deck feel more like a garden. 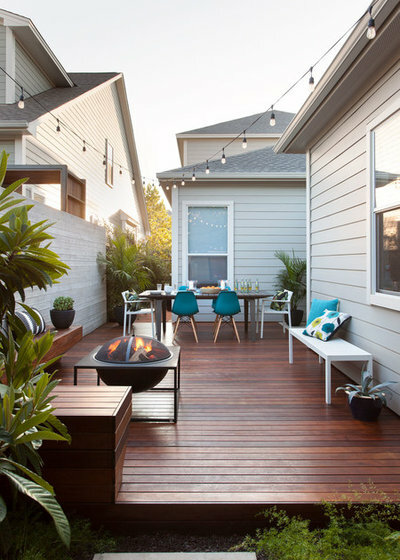 But for tiny decks, like many in urban areas, potted plants compete for space with higher-priority items like chairs, a table or a grill. Elevate your plants if floor space is tight but you still want the feeling of a garden. Use hanging baskets, window boxes, over-the-railing planters or vertical gardens to maximize space. In interior designer Julia Mack’s Brooklyn, New York, backyard, a basket dangles from the upstairs balcony over the elevated deck, and window box planters on the outside of the railing keep floor space open. Decks of any size can benefit from having a source of shade, whether in the form of a pergola, mature tree or large umbrella. Adding an overhang to the side of a building, as was done for this deck in Japan, can save space by taking advantage of the support of an existing structure. Similarly, one could attach a shade sail to the side of a building to add shade in a small footprint. 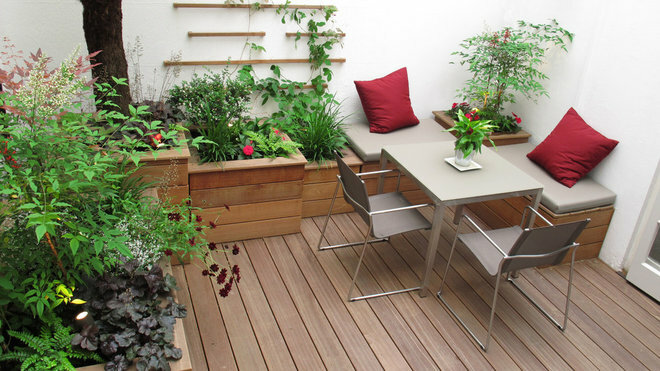 Built-in seating can be a significant space saver for small decks, as it allows a seating area to be anchored against a wall or in a corner and leaves the center of the deck open. In this lush city garden by Fenton Roberts Garden Design in London’s Marylebone neighborhood, a square table pulled up to two built-in seats makes for an elegant seating solution for a small terrace. 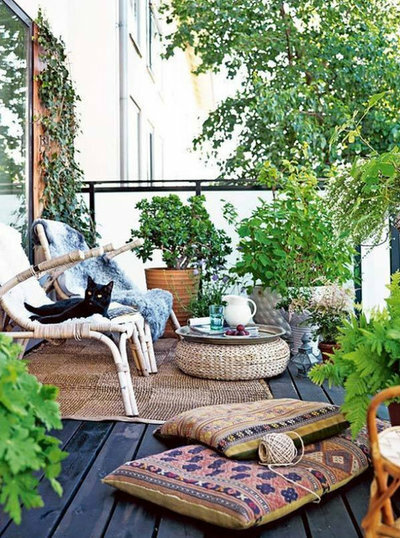 Give a small deck some style without changing your outdoor furniture or adding bulky accessories by rolling out an outdoor rug for the season. Look for outdoor rugs made of weather- and fade-resistant synthetic materials like polyester and recycled plastic, which can be easily hosed off to clean them. Rugs made of natural materials like jute are less outdoor-hardy and should be brought inside when it rains. 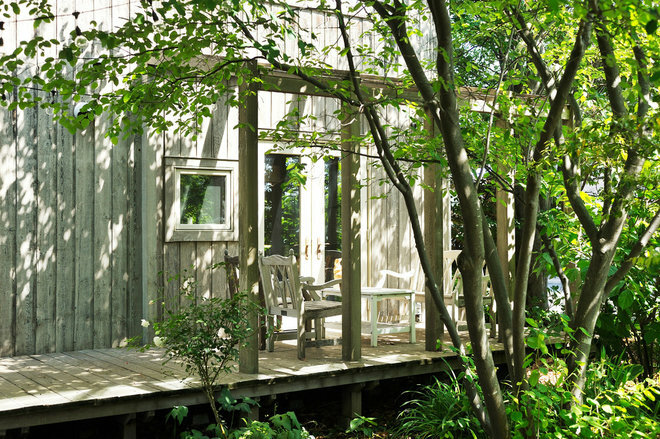 Small decks surrounded by walls can feel boxed in, but you can reduce this feeling by enhancing the walls around the deck. 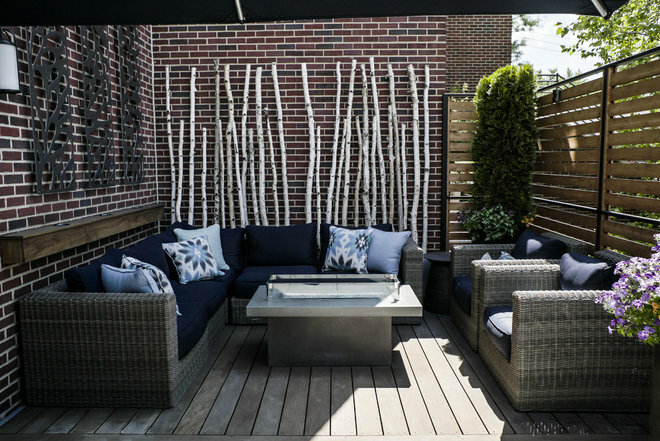 With this enclosed terrace by Chicago Roof Deck & Garden in Chicago, brick walls have become a backdrop for an installation of pale birch trunks along one side and metal screens along another. Vines like clematis (Clematis spp. ), Boston ivy (Parthenocissus tricuspidata) or Virginia creeper (Parthenocissus quinquefolia) can be planted on outdoor walls to create a lush green backdrop.